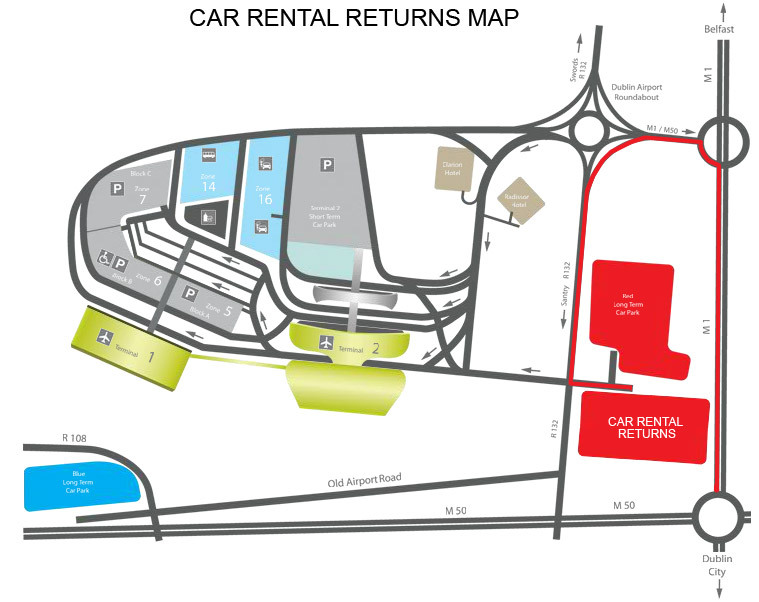 Dublin Airport Car rental returns for all car rental companies are located in Eastlands, beside Dublin Airport. The area is clearly signposted as car rental returns from all routes approaching the airport. If you are returning a rental car, you will take the M1 north towards Belfast and follow the signs for Dublin Airport. The car rental returns area is very well signposted. Within Eastlands, Europcar, Hertz, Avis, Budget & Dan Dooley each have a separate unit which clearly signposted and easily seen. Once the car has been returned, shuttle buses are operated by each individual car rental company from Eastlands to Terminal 1 and Terminal 2.